Welcome to our Stamp of the Month Blog Hop! We will be featuring January's SOTM called "Little Reminder". If you've come here from Michelle's Blog you are on the right path! 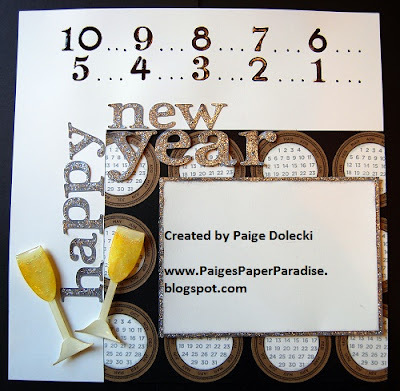 The blog hop is a great big circle so you can start here and work your way all around. If you get lost along the way, you’ll find the complete list of participating consultants here. My project is a glitzy, shiny countdown to New Year's layout complete with champagne glasses! I can't wait to take a picture of our toast tonight to add to this project! 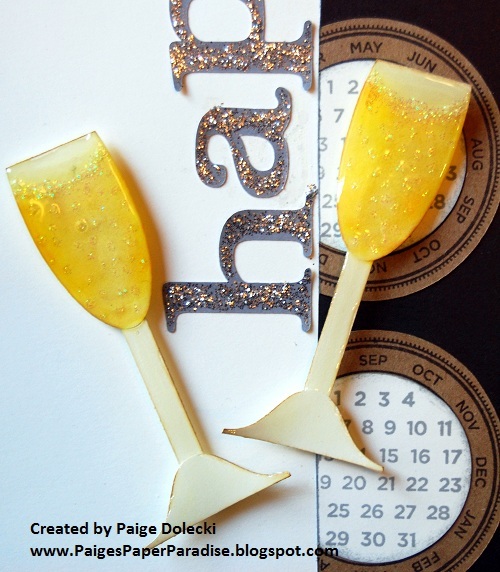 I had the most fun creating the champagne glasses out of Art Philosophy cuts. I used an oval shape and cut off the top, a mat shape and cut off one edge plus a small strip of cardstock to join the two. I used my waterbrush and applied yellow inks to get the color I wanted. I made a water line and tiny dots with my Stardust Glitz Gel, outlined the glass with Desert Sand sponging and coated the entire thing with a thick cover of Liquid Glass. They took a full day to dry but I love the results! I used Gray Wool cardstock to cut my letters and my mat. The Silver Glitz is the same color so the entire letter and mat look fully covered with silvery sparkles even if I missed a spot! Now "Hop" on over to Angel's Blog to see her work! I know she'll have something wonderful to share! Remember, the January SOTM is only available until the 31st! So contact your CTMH consultant or visit my website at www.Paige.MyCTMH.com and order this set for just $17.95 or get it for just $5 with a $50 order! Love your layout, especially all the glitz and glimmer. Happy 2012! Spectacular layout and I love the champagne glasses. Very creative! Talk about bling & bubbles too. Love the layout! 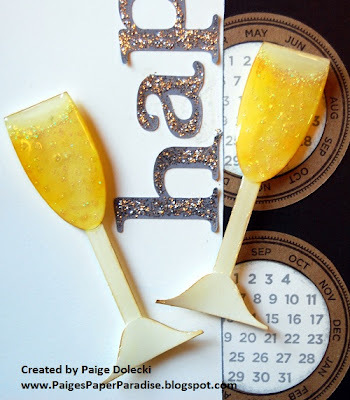 I read how you did the bubbly champagne glasses and I am just blown away at how gorgeous these are!! Not to mention that you blew me away anyway with that layout!! Great layout! 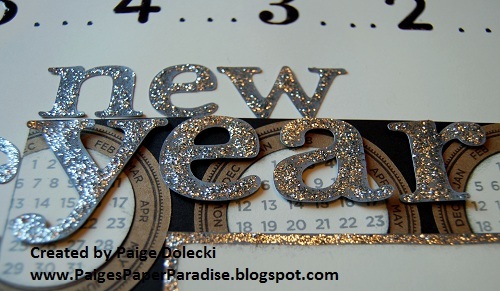 Love the glitz on the lettering. Very festive! So pretty and sparkly! I love it. It’s in point of fact a nice and useful piece of info. I’m satisfied that you shared this useful info with us. Please stay us up to date like this. Thank you for sharing. TOO PERFECT! You fit the day with the stamps! Great Job! Very festive layout! Love the glitz and the champagne glasses are so cute. Nice job, Paige-girl! Really a great artistic culmination of the NY feeling. Happy New year, too!